Celtic have "indefinitely suspended" two fans from attending matches home and away after the use of flares inside Fenerbahce's stadium in Istanbul. The Glasgow club face what would be a fourth sanction this year from European football's governing body, Uefa. "There have been calls from many for Celtic to raise a civil action in relation to recovering any fines imposed," said a club statement. "And this is something which the club will consider." 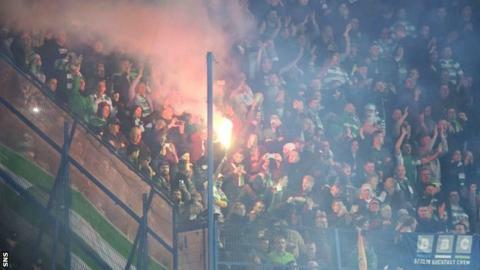 Celtic were fined £7,300 in February for supporter behaviour during a game away to Dinamo Zagreb. They had to pay £9,500 for two charges of misconduct during their Europa League match against Inter Milan in March. And the Scottish champions launched their own investigation ahead of Uefa making a decision on 18 February about the flares which were set off in Turkey during the 1-1 Europa League draw. "Celtic has repeatedly stated its strong opposition to the use of flares, but regrettably again, a very small number of individuals have damaged the club they claim to support, resulting in a further Uefa charge," they said. "Celtic supporters travel in their thousands to European matches and the club is always grateful and proud to have such a magnificent following from fans who have earned such a wonderful reputation. "However, we cannot allow the club and our supporters to be damaged reputationally, or financially, any more by a handful of individuals. "While we await Uefa's determination, we have been inundated with support from Celtic fans who want an end to this activity and, like the club, do not want those responsible associated with Celtic in any way."